Located in North Andover, Ma. this is a total basement remodel done in a condo unit. The size of this space is 13' wide x 35' long. Behind bifold door units are laundry room, utility room, storage area and to the far left side a stairway to living area. Not seen is a slider door walk out to outside. Unique design for porportion the bifold doors as well as closet doors on either side of entertainment center are custom made solid oak doors and bifolds with a height of 6'-2" to give the 7'-1" ceiling a look of more height. The sub-floor is an interlocking 2'x2' square moisture proof plywood with a solid plastic bottom with dimple legs to allow for airflow. A sound board was added to ceiling to sound proof basement room from above floor noises. Plenty of recessed lights to really light up the area on three sets of dimmers to divide up area's as used. A frameless lower entertainment center with space for all t.v. devices as well as a sound system with a "Bose" 6 way speaker system built into the ceiling for surround sound and a floor mounted sub-woofer complimented by a large 46" flat screen high def. T.V. 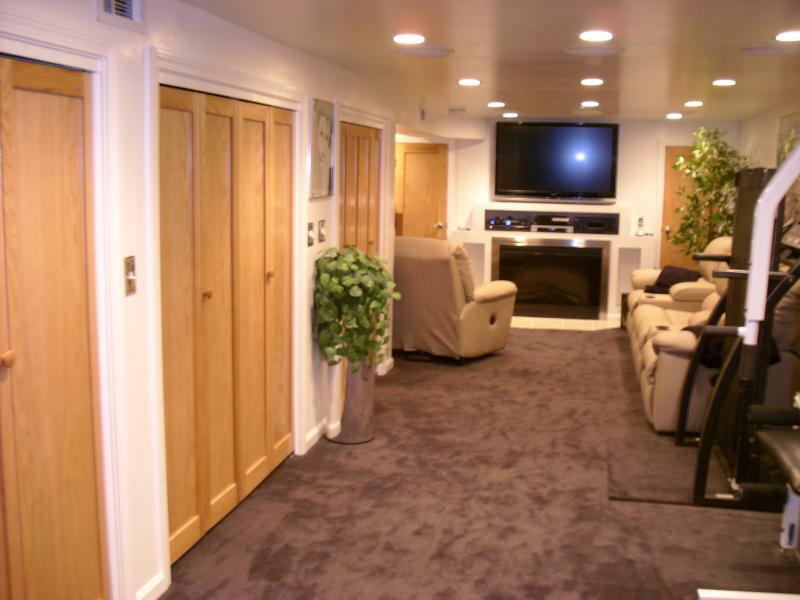 To top off the entertainment on the underside is a gas fireplace to really add a flare to this unique basement. On the right side to this end on the picture is a work out area. Well planned and well executed to provide all the dreams of the customers involved.